Want to play more of the sport you love? Then it’s definitely in your interest to make sure that you avoid football injuries wherever possible. The good news is that, through simply knowing what to do and taking a few simple actions, you can dramatically lower your chances of spending time in the treatment room. But sadly there’s no way of completely eliminating the possibility of getting injured (except maybe for not playing at all – and let’s be honest, who wants to do that?). At some point injury is likely to hit us all – often through no fault of our own. Injury can be a huge problem. It’s all too common to find people who took time out from football to recover from an injury, but who end up never returning. Either they never fully recovered, or by the time they did their fitness or motivation had totally gone. This needn’t be you. In this article we’re going to guide you through the best ways to keep yourself injury free, and help you effectively deal with injury if you’re unlucky enough to be hit by it. Injury is not an area where you want to cut any corners or take any bad advice. So, to make sure that this article was truly informed by an expert, we took the advice of one of the very best: physiotherapist, Nell Mead. knee injuries (ACLs and also twisting injuries). It can also include other things like concussion, hernias and even facial injuries (but thankfully these aren’t that common). 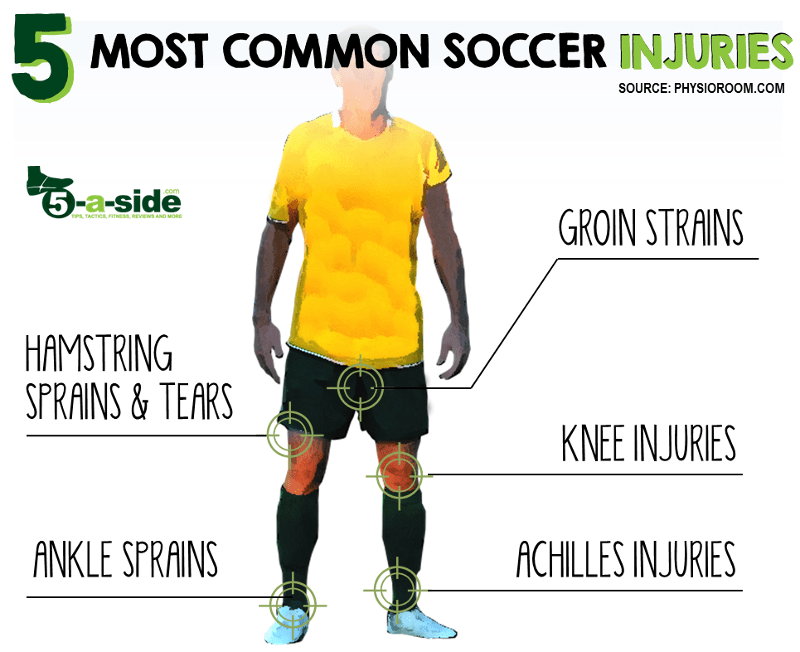 The type of surface you play on can also have an impact on the types of injuries picked up. If you’re playing in sports halls on hard floors, you might also come across more bumps and bruises as well as occasional fractures. With 3G turf there are less bumps and bruises, but there can be a lot of grip, and some unexpected stoppages. Depending on the age of the pitch and how well it’s maintained, sometimes the amount of slide, push off and grip can be unpredictable. Wear the right shoes – badly-fitting footwear, or wearing the wrong type of shoes for the surface can instantly put you at risk. Use shin-pads and ankle protection – it might not always be the look you’re going for, but they give you a degree of protection from dangerous challenges. Perform a warm-up before playing – a proper warm-up prepares your body for the activity ahead. Sadly, many amateur players skip the warm-up and their only preparation for the game is a hamstring-risking routine of lashing shots at an unlucky goalkeeper. Every professional athlete on the planet will do a proper warm-up before they do their sport. There has got to be a reason for that. Proper warm-ups and wearing the right kit are instant wins, but there are even more things you can do to keep your body injury free. Looking after your body is really important if you want to maximise the football you can play. 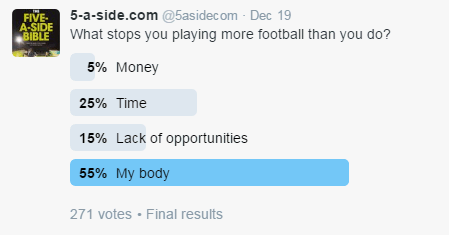 Our survey showed that the single biggest reason people didn’t play more football was because their bodies can’t handle it. In simple terms, the better your proprioception, the less chance there is that you’ll find yourself crumpled on the floor after your knee or ankle unexpectedly buckled on you after you reacted (or failed to react properly) to something. SAQ training (speed, agility, quickness): this helps the body react faster and better. The more you can train your body to stop, start and change direction efficiently, the better you will be at it and the lower your chance of getting injured. Wobble cushions / balance boards: This, relatively inexpensive piece of kit helps improve balance and coordination whilst standing. It can be used to work on core and lower body strength and to stabilise and strengthen muscles and joints. Nell has her clients standing on them and doing squats, even progressing to them doing it with their eyes shut to really sharpen the nervous system. “Go out and get a wobble cushion, and stand on it with your knees slightly bent. If you’re doing any of the exercises wrong, it will tell you: because you’ll fall off it. Wobble cushions are a fantastic bit of kit. 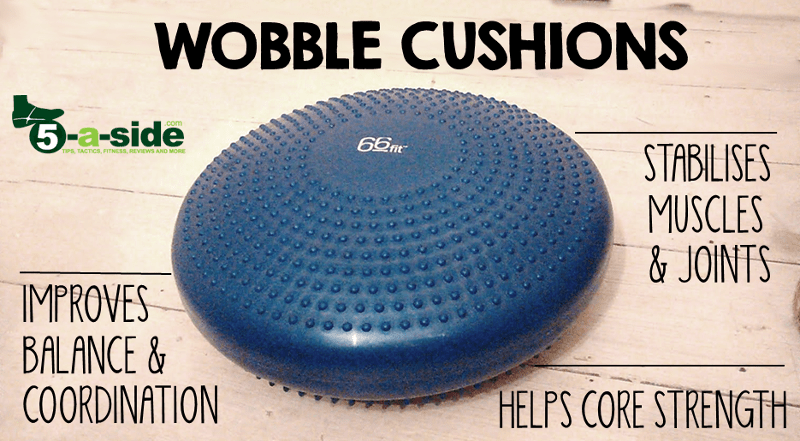 The wobble cushion Nell recommends to her patients is available here on Amazon*. A lot of people’s daily routines involve significant time spent in static positions such as sitting on transport or at a desk, or standing for long periods. That’s not always great physical preparation for exercise. Our daily routines often mean that we’re not utilising the muscles we need for sport anywhere near as much as we could. This can develop inflexibility. The benefits of flexibility are something that many of the pro footballers are tuned in to. Ryan Giggs, for instance, famously put his career longevity down to regular yoga sessions – a form of flexibility training. Considering he was still playing top level football for Manchester United until age 40, it’s worth listening. You can do simple stretches after exercise, at home. It’s also worth getting a foam roller like this one*, which allows you to self-massage muscles that are tight simply by rolling the affected body part over it. Both will give you gradual improvements in your flexibility and reduce the risk of injury. 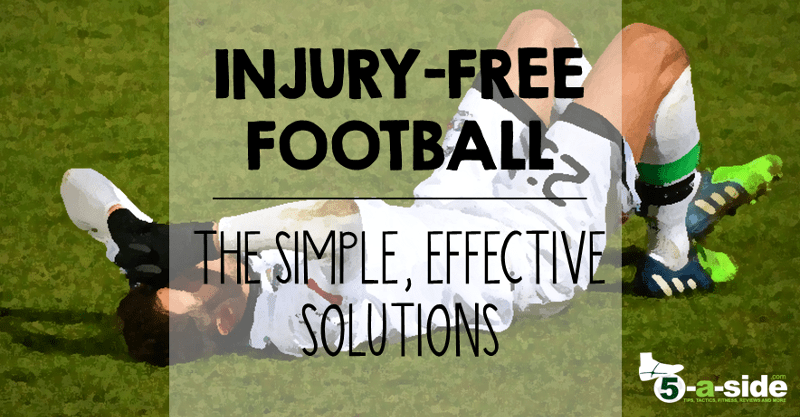 The majority of minor injuries sustained playing football can be treated with RICE – the acronym that stands for ‘rest, ice, compression and elevation’ – without specialist intervention. Even just by using simple RICE techniques you can significantly shorten the time that you spend out injured. If you’ve got mild sprains and strains then you need to be applying these techniques to get you on the mend. See our easy guide to managing injury using RICE for the full detail. There are times, however, when you need to do something more than that. The first of those is where you’ve got a serious injury. Usually it will be obvious what’s a serious injury simply because of the pain it is causing or the way it is limiting your movement. In this circumstance you may need to see a doctor or a hospital immediately. But then there is a second type, one that can be tricky to know what to do with: there are those injuries that you thought would heal on their own but do, in fact, need some assistance from a physiotherapist. Do injuries get better with time? “If you can move normally and put the normal amount of stress and strains through your muscles, bones and tendons then it will heal better because it’s all about the force that you put through it. That, of course can give you longer-term issues. That’s why it can be beneficial to see a physio rather than manfully struggling on for weeks in the hope that your injury will magically heal. If you’re wondering if you need to get your injury looked at then you’ll want to check out our article: should I see a physio. For all of us injury is a real threat to our continued enjoyment from playing football, so it’s worth taking some precautions. Chances of injury can be significantly reduced by just simply wearing the right footwear, wearing shin pads, and by warming up. You can also train your body to be able to better protect against injury – especially useful if you’ve been injured already and need to strengthen as well as protect. When you’re doing this, focus your ability around improving two things in particular: balance and flexibility. If you find yourself already suffering from injury, most minor sprains can be effectively treated with rest, ice, compression and elevation (“R.I.C.E”). But if your injury is serious, or isn’t healing well within a week, it’s time to see a specialist. Huge thanks goes to Nell, Mead Clinical Director of London-based Victory Health & Performance for help with this article. If you’re in London and looking for top-notch physiotherapy services, book yourself an appointment with Nell. The hardest bit for me is knowing when to rest. At the moment I’ve got a hip problem that I just kept playing through, taking painkillers. I’ve got myself in a bit of a mess now, but I just didn’t want to stop playing at the time. I’m looking at being out for a couple of months now and it’s so frustrating. Thanks Adam! Totally agree about the warm-up. I didn’t really discuss this with Chris when he interviewed me, but getting your nervous system warmed up is just as important as getting your joints and muscles warm. Professional sportspeople do lots of this – just simple stuff like keepy-uppies and change of direction exercises (running round cones etc) for footballers, to get your foot-eye coordination going. Some really good information in there. The analogy of needing to treat yourself like more of a classic car in your old age really rings true with me! For me, it’s the warm-up that is the key! So many people overlook it, but it’s so important.